Death records are often one of the few sources of written information on Aboriginal individuals in the early contact period, and provide some evidence, although patchy, of Aboriginal people’s lives in the area. The churches and government authorities did not record all of the births, deaths and marriages of Aboriginal people, so the records need to be regarded as incomplete, and not necessarily representative. Nonetheless, some records remain which note people of Aboriginal ancestry being buried at Camperdown Cemetery next to St Stephens Church on Church St in Newtown. An early burial in Newtown was that of Tommy, aged 11 who was buried in 1863 at Camperdown Cemetery. His occupation was listed as being that of a ‘labourer’. Newspaper accounts noted that he had been brought to Sydney 18 months earlier, and lived at Paddington, in the ‘care’ of a non-Aboriginal person, who said they had hoped to reunite him with his people. It is unclear as to whether Tommy came to Sydney voluntarily or otherwise. The reference to him as a labourer suggests he may have been brought to Sydney as a worker. 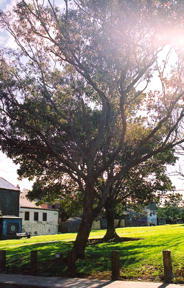 Mogo, William Perry and Wandelina or Mandelina Cabrorigirel are mentioned in cemetery records as having been buried at Camperdown Cemetery. William Perry died 25 Sept 1849, at the age of 26 years and lived at Pitt St in Sydney.. Atree was planted for him next to his burial stone. Meader notes that Mogo died on 5 October 1850 and was originally from Towel Creek on the Upper Macleay Valley. His grave was covered with shells from a Pittwater midden, and these are visible in a photo taken at the unveiling of a monument for him on 22 August 1931. Who was responsible for the decoration of the grave is not known or what his contemporaries thought of this. 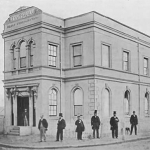 Wandelina died of influenza, aged 18 at the Benevolent Society Asylum (where Central Railway is today) in 1860. This information suggests that Aboriginal people were travelling either by choice or under duress around the colony. 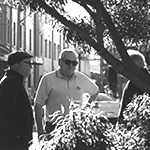 The Camperdown/Newtown area, as with many other areas in inner Sydney, was a place where people seem to have gathered from different areas, together with the established traditional owners, the Gadigal people. The cemetery site became a place of commemoration and a focal point for remembrance by non-Aboriginal and Aboriginal people. In paying their respects, Aboriginal people can also be seen to be reinstating Aboriginal people’s extensive connection with the area and the site. In 1932, a memorial service was held at the sites of Mogo and Perry, on the Lennox St side. An Aboriginal man, from La Perouse, Tom Foster spoke, played a hymn on a gum leaf and also planted a tree in memory of these Aboriginal people. Tom Foster and his wife Liza attended church in Newtown on Sundays, according to Iris Williams of La Perouse. Tom was well-known as a singer and performer of gum leaf tunes and was an outspoken critic of the Aborigines Protection Board at the time. “the aborigines had three enemies: the Aborigines’ Protection Board, which had forced them to do as the white man wished, the white missionary, and liquor’. 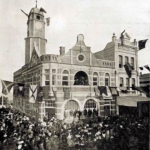 Again this suggested the connections of people across suburbs and areas, and a continuing respect from those who had passed on and connection to this place. Another contemporary means of remembering people buried is through music, such as Mixed Relations song ‘Newtown Dreaming’, written by Bart Willoughby and Murray Cook in the 1990s.Bart Willoughby is well known for writing the classic anthem ‘We Have Survived’ with No Fixed Address, and the songs ‘Take it or Leave it’ and ‘Aboriginal Woman’ with Mixed Relations. consequences. It is also a song about endurance, and trying to keep culture alive, and remembering those who have gone before. The Rangers League of NSW, erected a sandstone obelisk in 1943, in memory of Mogo, Perry, Wandelina and other Aboriginal people buried at the Camperdown Cemetery and a Norfolk Island pine was also planted to commemorate them. This memorial still stands near the surviving headstones. Other people were not remembered with specific memorials, but were recorded by Europeans as being buried there as well. Mary, an Aboriginal woman from Balmain, who died on 25 August 1879 was buried at Camperdown cemetery according to Gledhill, one of the cemetery trustees and a keen historical researcher. Other people who may have been of Aboriginal or Torres Strait Islander background were also buried at the cemetery. For example, there is a record of George Papas, who was a sailor and died in August 1849 at the Sydney Infirmary, at the age of 35. On his burial certificate he is referred to as a ‘man of colour’, which suggests he was Aboriginal or African, but his last name also suggests Greek ancestry. In a commemorative Camperdown Cemetery Trust publication of 1934, George Pappas is listed with the Aboriginal graves. The Sydney Morning Herald reporting Papas’ death, noted that he worked on the ship Duke of Roxburgh and became ill on the voyage from England but refused treatment. Authors have claimed that other Indigenous people are buried at this cemetery, including Billy Bush. He was from the South Seas Islands, and was either a sailor or passenger and died in 1861 at the age of 20 on the ship Prince of Denmark. The ship was returning from a whaling trip. The burial registration for him gives no indication that he was definitively Aboriginal or Torres Strait Islander, though he may have been. 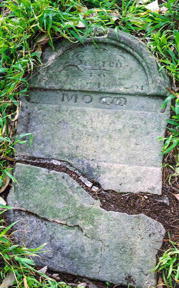 Another ‘South Sea Islands’ passenger named Jerry died in 1862 at the age of 20, and he was also buried at Camperdown. He had sailed on a ship called Freak. He may have been from the Torres Strait, as Meader states, but this is not completely clear and he may have come from other Islands in the area. Toby, Biddy and Dora are also recorded in NSW Births, Deaths and Marriages records as Aboriginal people who all died in 1888 in Newtown.Unfortunately their family connections are listed as unknown. Another man, Jack is recorded as having died aged twenty died at Camperdown in 1896. Copies of the certificates may provide further details of where these people were from However, details of their parents are often listed as ‘unknown’. The information is fragmentary and it would require further family history research, discussions with Aboriginal genealogists and knowledgeable people within Aboriginal communities to find more connections and build a richer picture of these peoples lives. 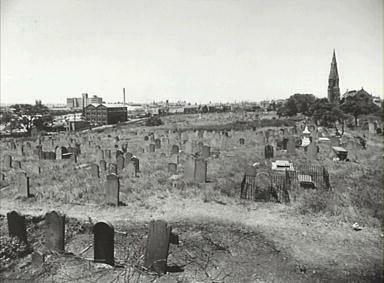 The area of the cemetery where Aboriginal people were buried became known as ‘Cooee Corner’ according to Reverend Rees. It continues to be a significant site for Aboriginal people today.